This past month I have been slowly going through my Vietnam files and cataloging the Propaganda leaflets. 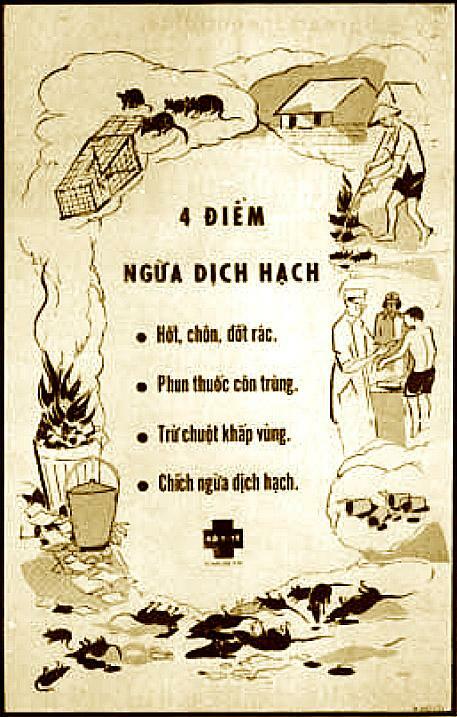 Thousands of different leaflets were prepared by American forces during the Vietnam War and the vast majority was on subjects like the Tet New Year or the Chieu Hoi (Open Arms) defection program. I did notice one oddity that I had noticed in the past. There were a lot of leaflets that used poetry as the propaganda text. I had almost 50 of them. What could that mean? 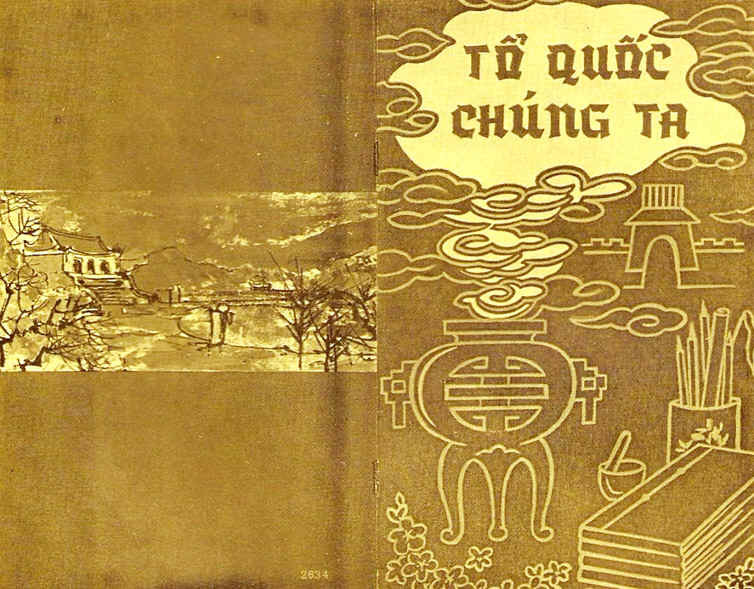 It would seem to indicate that the Americans believed the Vietnamese had a deep and abiding love of poetry and could be manipulated through it. From a propagandist point of view, your subject doesn't need much education to understand popular poetry, and a message embedded in such poetry would penetrate a much boarder audience, far better than say, a Party resolution which typically uses a lot of Chinese-Vietnamese words. Poetry also helps your subjects to remember the message longer. A poem can also bring tears to anyones eyes. Bumper sticker phrases are catchy but do not create emotions. I grew up with my grandparents and I remembered my grandpa, my dad, and my mom used to recite poems daily... in lullaby, after telling a story they heard in market, or even when they lectured me. They memorized poems so well and a lot of ancient poems or quotes became their guidelines of life principles. Do try to make use of the medium of poetry. However, the quality of the Poetry must be at least better than mediocre. More enthusiastic and favorable responses have been obtained from messages in the poetic medium than any other form. Poetry is particularly as a medium for emotional and/or sentimental appeals. To insure the quality of the poetry, a well-known, popular poet should be employed, and the resulting product should be field tested before it is distributed. Although good poetry seems to elicit favorable reactions, bad poetry appears to be capable of eliciting the most unfavorable reactions of any medium. I do feel the need to write sort of a disclaimer here. We Americans enjoy poetry because of the rhythm and the rhyme. I am sure these poems have that attribute in the Vietnamese language. Unfortunately, when translated to English that is all lost and the emotion and intellectual connection is lost. So, although an American reader may find the poems not emotionally pleasing, I think we can assume that they would be extremely emotional and enriching to a Vietnamese. You're so right. The translation sometimes killed the meaning and the emotion embedded inside a Vietnamese poem. These poems affected the Vietnamese soldiers because they touched the deepest corners of their hearts. Americans who can only read the translated version will find it difficult to understand the emotional effects. But to a Vietnamese, the words could cut thru stone and got to the deep center inside a soldier, which often was hidden well beneath the tough layers. Most of these poems in the leaflets that you posted targeted the natural emotions of the love from a son to a mother, the yearning to go home to his birthplace, his town, a peaceful life filled with happiness without sounds of gunfire and images of dead bodies. As long as the poem is correct in Vietnamese, how the Americans translated it does not really matter. It does not matter how Americans read it, what is important is how the Vietnamese read it. We could butcher the translation of the poem, but as long as it moved the Vietnamese and perhaps worked toward the end of bloodshed and the coming of peace it was worth doing. This leaflet uses poetry as a medium of communication. 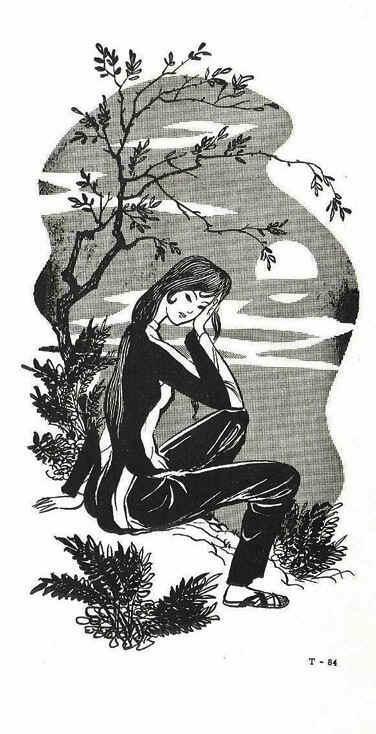 In fact, some of the best leaflets ever used in Vietnam have consisted of emotion-provoking poems, with suitable illustrations related to the thematic content of the poem. Poems frequently express nostalgia, sorrow and longing more effectively than is possible in prose. But the poetry must be good, or it will be scorned. Do not use amateur poets; employ or use material from popular and well known poets. life should blossom like a flower. the day and rested at night. Explode the mines and sow death around? It was the blood of people like you, mother, and myself. The above letter in poetry form was found on the body of a dead soldier of the Hanoi regime killed in the battle of Duc Co. The best way to tell of good will is with a poem. All of the men in my unit knew the lines of a poem used in South Vietnam and we thought of it often. The poem that we remember is for our mother. Approximately ten percent of the propaganda leaflets [At the time] were directed against the military and civilian personnel who used and maintained the Ho Chi Minh Trail. The PSYOP objective of this out-of-country Trail Campaign was to weaken the will of military target audiences and encourage them to rally upon arrival in the Republic of Vietnam. Along the Trail, the vulnerability of loneliness was attacked by using leaflets with nostalgic poetry written by NVA soldiers about their life at home. The themes of hardship and probable death were constantly brought to the NVA soldier's attention as he moved down the Trail. Once in the Republic of Vietnam, the NVA soldier was confronted with the Safe Conduct Passes urging him to rally. There were a half-dozen poems used by the soldiers heading south on the Ho Chi Minh Trail. Those leaflets are identified by the T for Trail at the start or end of their code. 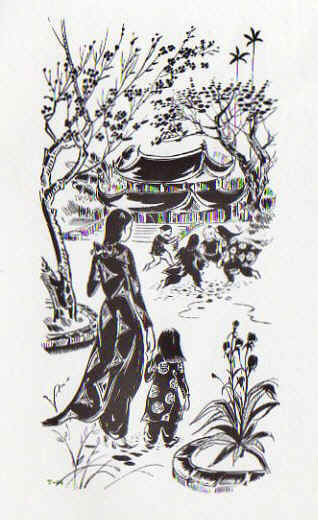 The Poem to Mother was used again on this Trail leaflet. Leaflet 78T is bright red on the front and depicts happy scenes of life in North Vietnam. The back is blue and depicts a sad North Vietnamese soldier thinking of death and destruction in South Vietnam. This leaflet was dropped on troops coming down the Ho Chi Minh Trail. The poem is printed as a legacy and warning to other young men who have been sent south to die. Note that this poem was considered so important that it appeared on several different leaflets in black and white and in color, and in various sizes such as 3 x 6-inches, and 5 x 7-inches. Two of the leaflets using this poem dropped on North Vietnam are 29, and 78. 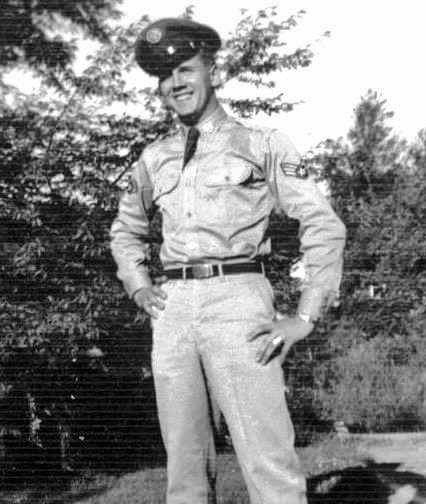 David G. Underhill enlisted in the United States Air Force in 1951. He volunteered for Korea and was assigned to the 4th Fighter-Interceptor Wing Headquarters. He later enlisted in the United States Army and was deployed to Japan in the Office of the Commander-in-Chief, United Nations and Far East Command. He was recommended for OCS and studied Korean at the Army Language School, now called the Defense Language Institute. During the Vietnam War he served as a U.S. Army officer in the 7th Psychological Operations Group in Okinawa, rising to the rank of Lieutenant-Colonel. He was PSYOP liaison to the 1st Special Forces and trained and jumped with them in Okinawa and Korea. Prior to 1964 he was sent to Vietnam to access the needs of PSYOP units. He recommended a Battalion and four companies. He was awarded Legion of Merit awards in 1967 and 1973. In 1968 he was awarded a Bronze Star for his service while serving as Psychological Warfare Officer, Development Branch, Psychological Operations Directorate, United States Military Assistance Command-Vietnam. He wrote the Bible of leafleting, The Low, Medium, and High Altitude Leaflet Dissemination Guide. The Vietnamese loved poetry. We reproduced a poem written by an enemy soldier that was taken from his body on the field of battle. It was based on his experiences in the war and the fact that he had been deceived by the authorities. It was a very sad and sentimental poem. When I was in Laos to write a strategic leaflet program for the American Embassy, a Central Intelligence Agency representative mentioned the leaflet. He said it was a very powerful leaflet and every prisoner taken could recite the entire poem from memory. He wanted to know who produced it. When I mentioned that our organization had produced it, he wanted to obtain the leaflet in quantity. I was able to immediately divert to him a shipment of several million copies that was destined for IV Corp, an area where there were few North Vietnamese regulars. The CIA representative was appreciative and impressed with our efficiency. We produced several nostalgic poem leaflets for use at Tet in the 6x3 size for use throughout Vietnam and the Ho Chi Minh Trail area. My Vietnamese advisor helped develop poetry leaflets. He was Catholic, a former college professor, and had to flee North Vietnam when the French left. After US troop withdrawal we hired him and placed him in charge of leaflet development. 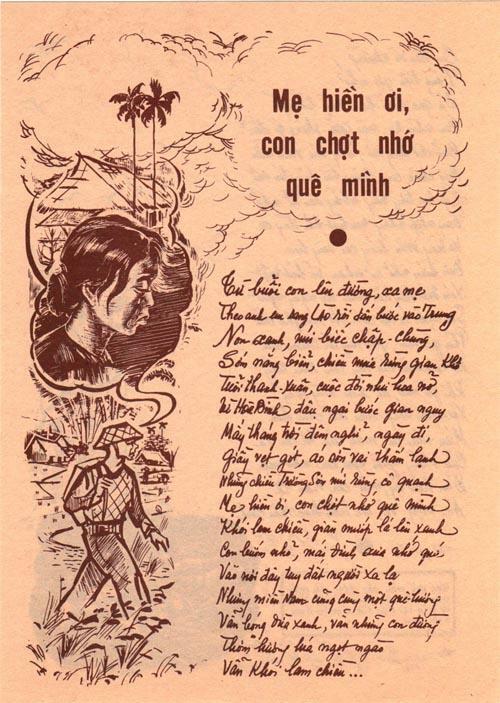 I looked through my files for an example of what Dave was talking about in his last paragraph and here is a Tet-themed poetry leaflet dropped along the Ho Chi Minh Trail. I note that some other poetry leaflets dropped over the Ho Chi Minh Trail about the same time are: T-42 (New Years Day); T-43 (Longing for the North); T-50 (Village Gate); T-52 (My Native Village) and T-53 (My Home). All were obviously produced to invoke nostalgia and homesickness. How could you know what revolution is? Take a husband my love, for my life is fast ebbing. Although I must lie to myself when giving you this advice. But, my darling, I must think of your future. Dont delay because the fires here in the South burn fiercely. My arm is torn from the body and with my lifes blood I write this last plea? No longer do I live in the darkness of the silent jungle. Dear Comrade, sweet spring approaches and the memories are so vivid! I remember the springtime when we were still together. Note: The three-fourths of the land and the Fourteen million people are quotes from a famous NVA propaganda poem about coming down to liberate the South. One soldier who worked in intelligence and spoke Vietnamese told me that he picked up this leaflet in I Corps near the DMZ. Other Ho Chi Minh Trail leaflets in the form of a poem are: T-42 (New Years Day); T-43 (Longing for the North); T-52 (My home); T-53 (My village); and 82T (To the other side of the front lines). Tet Nguyen Dan is the Vietnamese lunar New Year Festival and the most important Vietnamese holiday. Literally, Tet Nguyen Dan means the first morning of the first day of the new period. Tet falls sometime between the last ten days of January and the middle part of February. It comes at a time when there is a pause for the farmer after twelve months of labor. The Vietnamese Tet holiday is an occasion for an entire people to share a common ideal of peace, concord and mutual love. The Tet holiday is officially three days long but is often celebrated for seven days. During this holiday the people take extra care to be kind and not show anger or act in a rude way toward anyone. Every year the American PSYOP Teams would prepare dozens of propaganda leaflets using Tet as a theme. We show some below. While conducting research for the Tet campaign, it became apparent that the Vietnamese people have a highly developed appreciation of poetry. 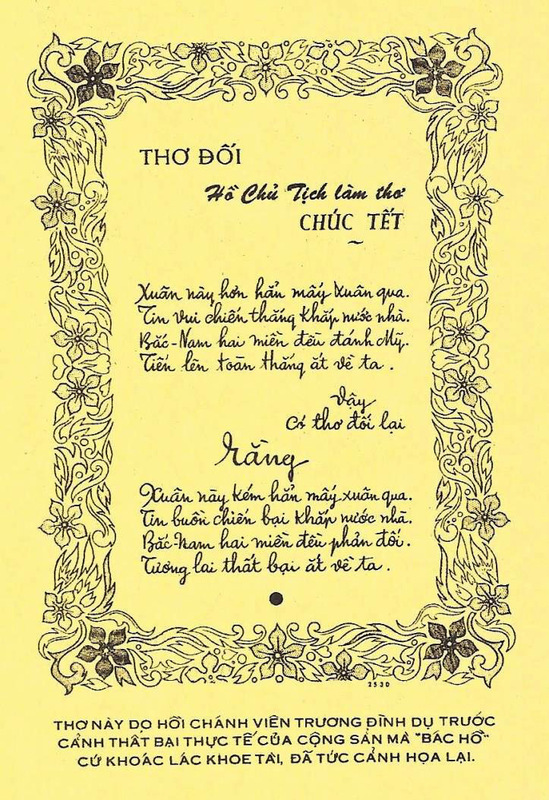 The 8th Battalion has in the past used the works of some of the better known Vietnamese poets in Chieu Hoi appeals, but good poetry of a contemporary nature was not available. To obtain some contemporary poems, the Battalion is sponsoring a poetry contest in cooperation with the 20th Political Warfare Battalion and the Regional PSYOP Coordinating Center. The contest offers cash prizes for poems with patriotic themes, the best of which will be used in developing PSYOP materials. The response so far has been greater than expected, and several usable items have already been received. The poetry material produced as a result of a contest sponsored by the 8th PSYOP Battalion has been printed. At present the booklets are being put together by the 204th Vietnamese Political Warfare Company for distribution by selected Armed Propaganda Teams within the coastal region of the II Corps Tactical Zone. 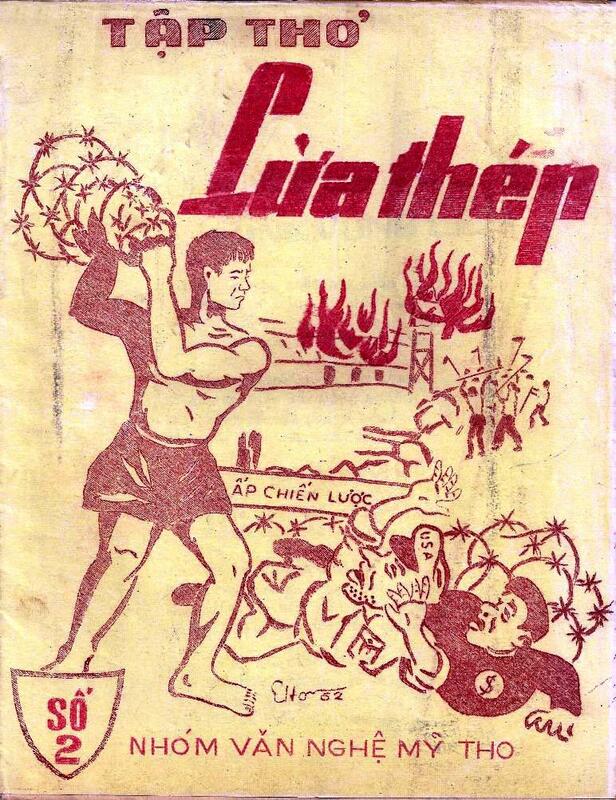 Examples of these booklets have been distributed to various Vietnamese units resulting in a generally favorable reaction. The first run was limited to a press run of 5,000 copies but more runs will be made if the project proves successful. The limitation on production is due to the fact that the folding and stapling of the booklet must be done by hand. Do you remember that today is Tet, The only happy day of the year? Your wife is yearning for a sight of you, and your children are burning to see you. Our cozy home feels cold and lifeless as ashes in a burnt-out oven. Do you remember the lines from this poem? The bamboo has swayed rhythmically for years. The people of all Vietnam are touched by these words of home. This peaceful scene is about to become a reality. Within 60 days of the signing of the cease fire agreement, all American forces will leave Vietnam. The soldiers of the North will be home long before Tet of the Year of the Buffalo. I suggest that this be considered for use on radio, television, magazines, newspapers and leaflets. This, after all, is a nation of poets. For I know that your heart is bleeding and your weeping soul longs for life at springtime. Oh come dead liberation soldier, do not deny that which is most precious to you. My heart aches as I write to you for we are both so far from our native land. This spring is significantly worse than the last few ones. Sad news of defeat throughout the homeland. A doomed future is inevitably there for us. 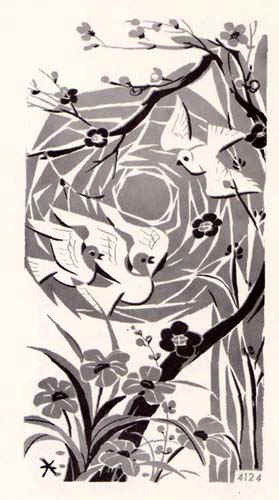 This small July 1968 5 x 8-inch booklet was titled Patriotic poems. It contained a collection of three patriotic poems and three full color illustrations reflecting the theme of each poem. This is a four lines instruction against the plague. They are rhymed to help the reader memorize them. (trung - vung and the intonation sequence). Yes they are definitely a short form of poetry in Vietnamese. 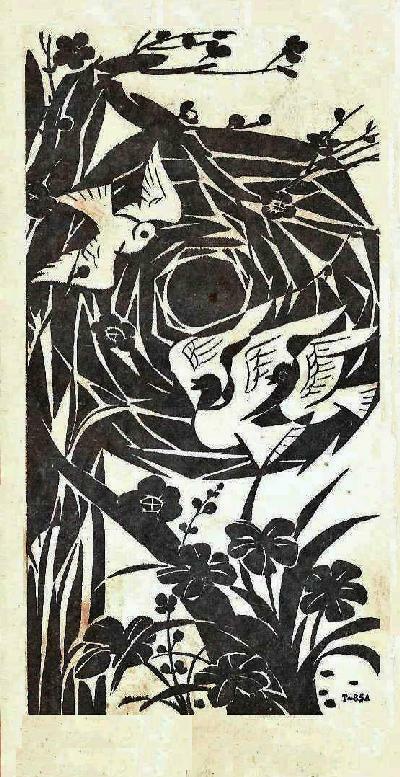 Later in the war, poems were even used on leaflets telling the people about the peace talks presently going on. The American leaflets would constantly tell the Vietnamese that there would be peace except for the Lao Dong (Communist) Party. In late 1972, as the Allies and the North Vietnamese began to talk, a major propaganda campaign was created to inform the people of the north of the peace talks. One of the earliest leaflets using this theme is 4583. One entire group all printed with a green vignette run from 4587 to 4591. 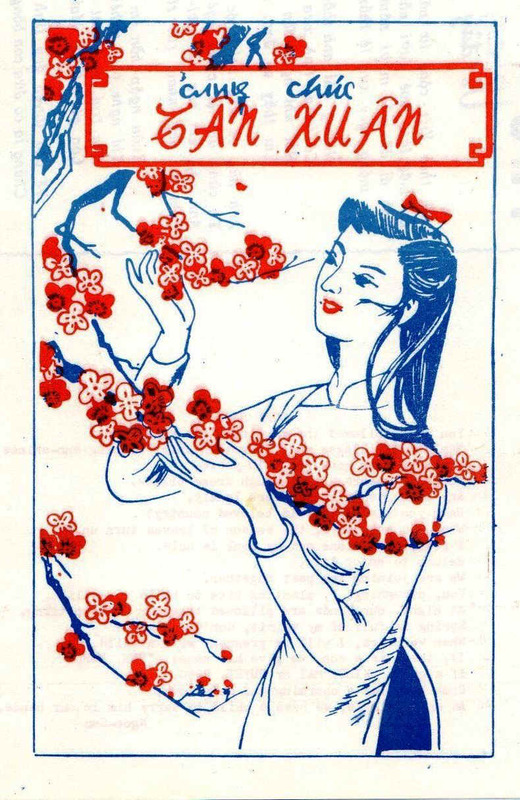 In all, there are several dozen leaflets with the theme of informing the people of North Vietnam. We illustrate leaflet 4588 dropped on 8 November 1972. Within 60-days of the signing of the peace agreement, all American forces will be withdrawn from Vietnam. North Vietnamese soldiers should be home long before the Tet Quy Suu (The Year of the Buffalo). This will be the happiest Tet in memory. In my village there is rice and mulberry. There are flocks of white storks and flirting words. There is a banyan tree and a temple roof. There are flocks of pretty, graceful country girls. In the autumn there are village festivals. In the spring crowds of children play with swings. The wind whistles a kite-flute song. Soothing the soul of the Shepherd boy on the dyke. Long before spring and well in time for Tet Quy Suu you should be home with your loved ones. Within 60-days of the signing of the cease-fire agreement, all American forces will be withdrawn from Vietnam. The North Vietnamese soldiers can return home. COME BACK HOME TO ME, MY LOVE! when the evening mist is brooding over the hills. and monkeys are singing sorrowfully. Do you feel the acute pang of homesickness? Do you feel hope lingering in your heart like the evening mist hanging over the trees? Do you feel sick thinking of your home and your native place? Do you know that spring has come bringing Tet? Do you feel downhearted at the thought of separation my love? Oh you, soldier of the North Vietnamese Army! how many springs since you left? Hear! Spring is here again this year. Do you still remember the country girl of that evening? my heart breaks and I cry whenever I think of you. and missing and yearning for a sight of you every passing minute. Spring is already here and today is TET. In front of our ancestors altar I earnestly pray for you. so that you may stay alive and return to your parents. Some other JUSPAO leaflets in the form of a poem are: SP-1737 (Remember you); 2610 (Poem from the diary of Ha Phong); 3588 (Some lines to my beloved husband); 4129 (Except you); 4435 (Disenchantment); 4435B (Evening Sky); 4459 (Letter to my comrade at springtime); and 4474 (No place to hide). 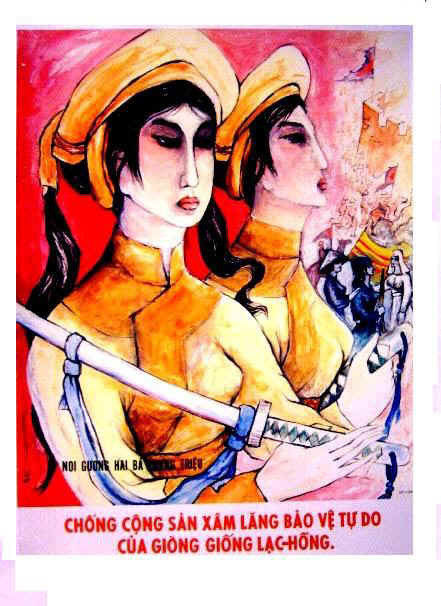 Because the Trung sisters were national heroes in Vietnam, they were often placed on PSYOP leaflets and posters. The Trung sisters were Vietnam's first real national heroes. The husbands of the Trung sisters were Vietnamese nobles who opposed Chinese rule. After the Chinese executed the husbands, their widows took over leadership of the rebellion. Legend says that in 39 AD they gathered an army of 80,000, led by 36 women generals and within a year drove the Chinese occupiers from 65 cities. Because they had liberated their country, they were named co-Kings. The Chinese returned with a huge force about three days later and after defeat on the battleground the sisters committed suicide by drowning themselves in 43 AD. Many temples are dedicated to them and their death is commemorated each year. to raise the flag to command the troops in place of the late General. echoing the horses' galloping toward the capital Long Bien. They swept Chinese leader To Dinh out of the capital. The national flag was raised high in the Me Linh sky. Dead larvae mark the passing of autumn. The northern wind announces the changing of seasons. Clouds cover four corners of the sky and rain is drenching everything. Winter has come and my heart is throbbing with emotions. I think of my friends still on the other side of the front line. The leaflet is called New Poem and another 3,000,000 copies were ordered by the 6th PSYOP Battalion to be printed by the 7th PSYOP Group on Okinawa. To be delivered to Plieku by surface shipment only. Do not ship earlier than the required delivery date, 5 January 1968, as adequate storage is not currently available. So, apparently the 6th PSYOP Battalion had so many leaflets in storage that they had no room for any more. A poem calling for the return of peace which existed prior to the Northern invasion of the South. The early morning bursts with streaks of red. The evening rain drops crystal droplets. The gusting breeze softly sings a lullaby. The mist lingers by the river side. Bring back peace to our country. Return the old happiness to the people. Don't send Northern lives to die in the South. 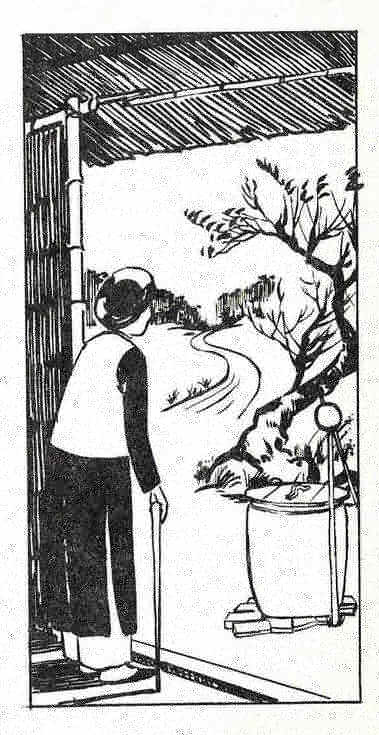 Another leaflet dropped on North Vietnam is: 29 (From the day I left you mother). 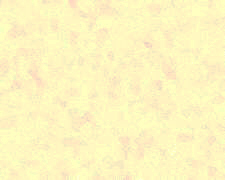 The image on Leaflet 116 is also depicted on JUSPAO leaflet 2564. 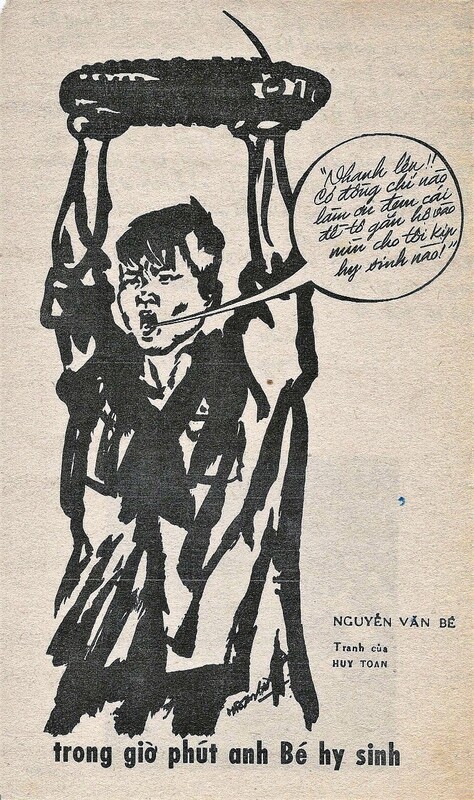 To give an example of how much Vietnamese loved poetry we need only look at a catalog of Viet Cong leaflets disseminated in 1962 and filed in a United States Information Service booklet entitled National Liberation Front Propaganda. A brief look at some of the enemy leaflets discloses: A poem aimed at a soldier away from home and family; a poem entitled A Mothers Words to her son in the army; Three poems taken from a collection called The Bright Road from the wife of a guerrilla to her husband; A book of poetry entitled Slash the Barbed Wire about Vietnamese trying to escape from government Strategic Hamlets; A poem entitled A Mothers Heart; A passionate poem that includes the words How inhumane is Diem and the United States, how tyrannically they betray the people, how miserable are the peasants and works; A poem from the wife of an ARVN asking him why he supports the wrong side; and a poem dealing with the cruelties of war entitled The Rice Field is the Reason for Existence. I could add many more, but this should give the reader an idea of the Viet Congs use of poetry in propaganda. Bravo the Liberation soldier. Our respectful greeting to you, the most handsome and heroic man! How often Saigon flared up in anger, with bare hands the people broke bayonets. Trees fell down to stop enemy vehicles; Boulevards were changed into battlefields. Hey Saigon! The fire is already opened! My chest palpitates at the rhythm of the firing. Our ranks stretch throughout 4,000 years. This is the offensive we expected since the days we slept on the ground and in trenches. You advanced forward and held up your head despite the pain in your legs. Your clothes were pure white. Your skinny body was stronger than death. Among the swarm of hired killers and writers stood on both sides, equipped with guns and bayonets. You went forward quite calm; and saw them as if you were a judge. This last poem is about the execution of the martyr Nguyen Van Troi. Here he is moments before his death. It seems that the Viet Cong entered Tet with confidence and the assurance that they would be victorious. Over 30,000 deaths later that movement was crippled and the North Vietnamese Army started coming down the Ho Chi Minh Trail to replace them. One of the most unusual psychological campaigns of the Vietnam War concerned the martyred hero Nguyen Van Be. Born in 1941 in Chau Thanh, he joined the guerrillas in 1961, and according to the legend, the young Viet Cong guerrilla was on a mission with his comrades on 30 May 1966 transporting explosives when they were attacked and Be was captured. Rather than submit, he chose to sacrifice himself and died a martyrs death. The American and Vietnamese troops demanded that he instruct them on the workings of an unknown explosive mine. Be did so. He picked up the mine high over his head, and shouted, "Long live the National Front for Liberation. Down with American Imperialists." He then smashed the mine against an armored vehicle, killing himself and 69 American and Vietnamese officers and soldiers. The problem is, none of this ever happened. Nguyen Van Be was found alive and well in a Vietnamese prison camp. 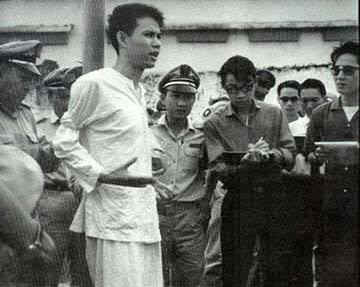 Be agreed to cooperate with the Government of Vietnam and told the true story of his capture in a 13 March 1967 interview. He said that the battle lasted just a few minutes and he had never fired a shot. Instead, he dove into a canal in an attempt to escape, but was captured when a Vietnamese soldier grabbed him by the hair. This started a propaganda war between the Allies and Hanoi, leading to endless poems about Be. Do you hear the explosion of mines to destroy the Americans? Nguyen Van Be, rose the great roar of your explosion. We shall live like you, you who knows not retreat. And every battle shall be fought as your fought it  forever. We shall follow your shining example. It is necessary to arrest those who wont sell their souls. It is necessary to fabricate photos, to collect false Bes. Millions of dollars, billions of leaflets. Ah! Such cheating. Leaflets have been scattered all over the two parts of Vietnam. 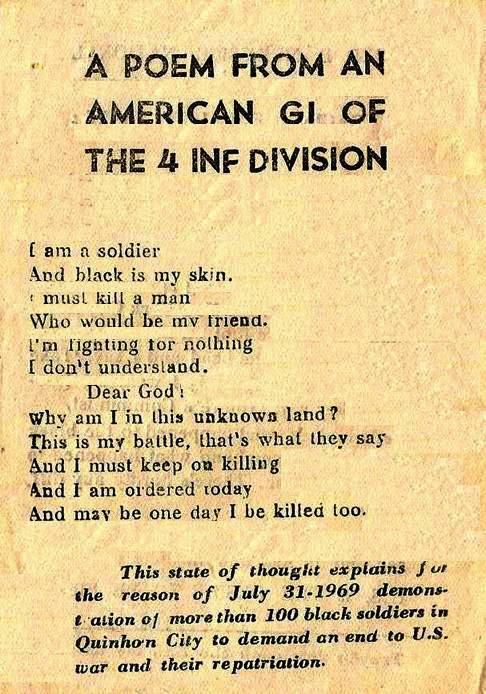 This is interesting because it is a leaflet bearing a poem allegedly written by a black soldier. We know the Vietnamese loved poems so it is possible that they wrote the poem. It is not signed, and if legitimate the Viet Cong would have certainly mentioned the authors name, rank and unit. The Viet Cong often used American politicians as useful idiots to advance their cause and on the back of this leaflet they quote Floyd B. McKissick, National Director of CORE (Congress of Racial Equality) in which he compares the plight of the Black American to the plight of the Vietnamese. What is particularly interesting about the Vietnamese love of poetry is that long after the war was over, American politicians and even Presidents seem to have quoted their poems in speeches to the Vietnamese. It was almost a way to give some credibility to what those officials said. For your information, all of the American Presidents speeches while visiting Vietnam - Clinton's, Obama's, and I think Bush's as well) cited a verse or two from Truyen Kieu, the trademark Vietnamese great poetic masterpiece. After they left, the Vietnamese would long comment on those verses, much longer than any part of those speeches. 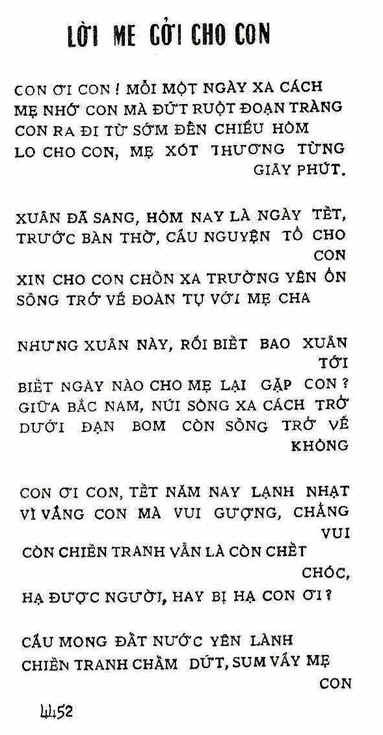 If you recall the speeches of American presidents or Vice presidents to the Vietnamese people after the war, they quoted the Truyen Kieu poem. 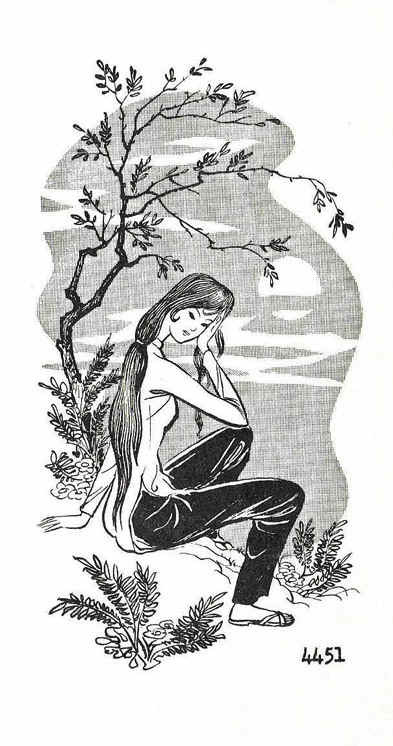 Although that poem is lengthy (it was an entire book written as poetry), many Vietnamese memorized it. Every single verse, every single line reflected an action, a decision, a choice, a destiny, a moral of life... 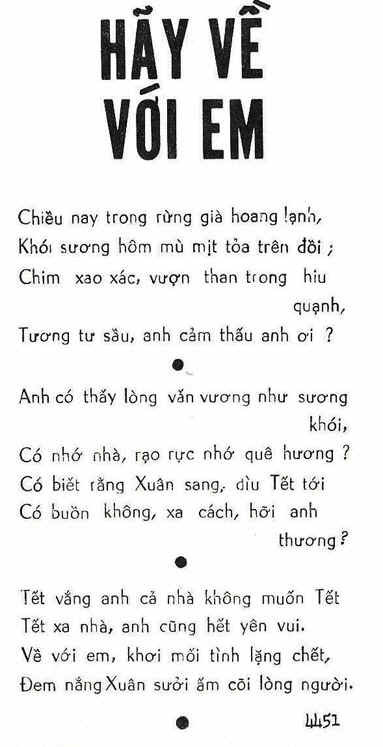 So when a politician quoted a few lines of that poem, every Vietnamese from young to old, could relate to what he wanted to say. It created a sense of connection. Please take from me this token of trust so we can embark on our 100 year journey together. This article is just a brief look at the use of poetry as a psychological Operations theme during the Vietnam War. Readers that wish to comment about this article are encouraged to write the author at sgmbert@hotmail.com.